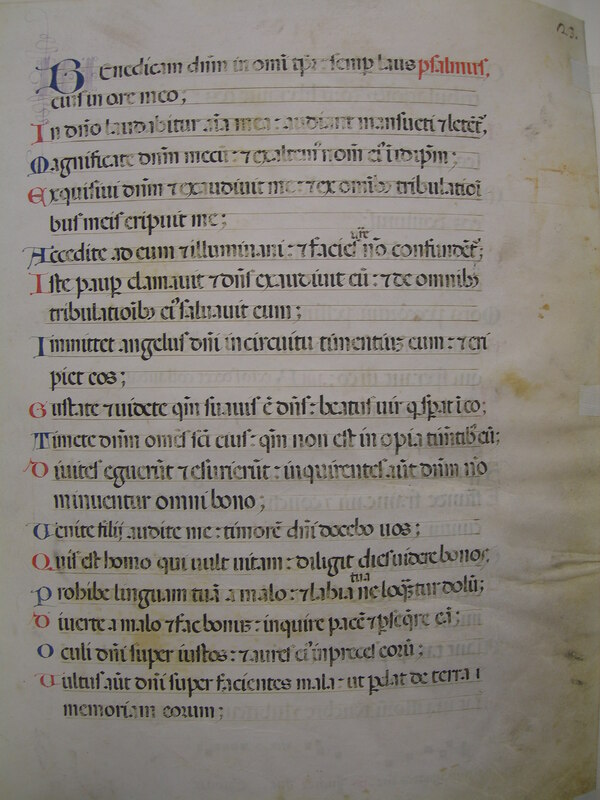 This leaf comes from an Italian psalter of the fifteenth century, and measures 38.5 x 28.5 cm. Ege states that it was made by Carthusian monks, making it a rare artifact of that minuscule order. The vellum is yellowed, with substantial wrinkling around the edges; the lining on the right side of the text area is especially noticeable. Black ink (showing indications of wear) is used for the primary text, and red, blue, and purple appear in the decoration. The leaf is not illuminated, but decorative details include large and small red and blue initials. The large initials have a purple interior and exterior line decoration as an accompaniment. The music at the foot of the pages was apparently added later. See Denison University Leaf 34 for more information about this manuscript. 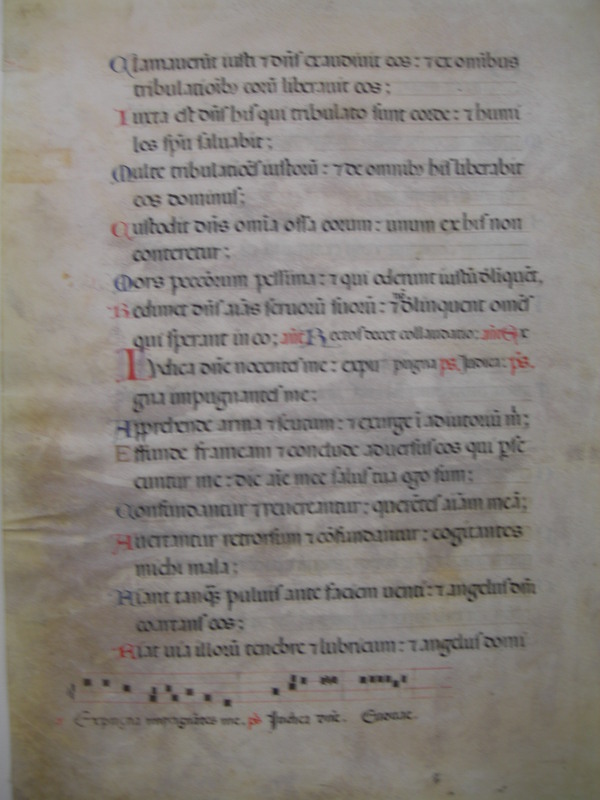 Text: Psalms 33:1-17 (recto); Psalms 33:18-34:6 (verso). Benedícam Dóminum in omni témpore; semper laus ejus in ore meo. In Dómino laudábitur ánima mea: áudiant mansuéti, et læténtur. Magnificáte Dóminum mecum, et exaltémus nomen ejus in idípsum. Exquisívi Dóminum, et exaudívit me; et ex ómnibus tribulatiónibus meis erípuit me. Accédite ad eum, et illuminámini; et fácies vestræ non confundéntur. Iste pauper clamávit, et Dóminus exaudívit eum, et de ómnibus tribulatiónibus ejus salvávit eum. Immíttet ángelus Dómini in circúitu timéntium eum, et erípiet eos. Gustáte et vidéte quóniam suávis est Dóminus; beátus vir qui sperat in eo. Timéte Dóminum, omnes sancti ejus, quóniam non est inópia timéntibus eum. Dívites eguérunt, et esuriérunt; inquiréntes autem Dóminum non minuéntur omni bono. Veníte, fílii; audíte me: timórem Dómini docébo vos. Quis est homo qui vult vitam; díligit dies vidére bonos? Próhibe linguam tuam a malo, et lábia tua ne loquántur dolum. Divérte a malo, et fac bonum; inquíre pacem, et perséquere eam. Óculi Dómini super justos, et aures ejus in preces eórum. Vultus autem Dómini super faciéntes mala, ut perdat de terra memóriam eórum. I will bless the Lord at all times, his praise shall be always in my mouth. 3 In the Lord shall my soul be praised: let the meek hear and rejoice. 4 O magnify the Lord with me; and let us extol his name together. 5 I sought the Lord, and he heard me; and he delivered me from all my troubles. 6 Come ye to him and be enlightened: and your faces shall not be confounded. 7 This poor man cried, and the Lord heard him: and saved him out of all his troubles. 8 The angel of the Lord shall encamp round about them that fear him: and shall deliver them. 9 O taste, and see that the Lord is sweet: blessed is the man that hopeth in him. 10 Fear the Lord, all ye his saints: for there is no want to them that fear him. 11 The rich have wanted, and have suffered hunger: but they that seek the Lord shall not be deprived of any good. 12 Come, children, hearken to me: I will teach you the fear of the Lord. 13 Who is the man that desireth life: who loveth to see good days? 14 Keep thy tongue from evil, and thy lips from speaking guile. 15 Turn away from evil and do good: seek after peace and pursue it. 16 The eyes of the Lord are upon the just: and his ears unto their prayers. 17 But the countenance of the Lord is against them that do evil things: to cut off the remembrance of them from the earth. Clamavérunt justi, et Dóminus exaudívit eos; et ex ómnibus tribulatiónibus eórum liberávit eos. Juxta est Dóminus iis qui tribuláto sunt corde, et húmiles spíritu salvábit. Multæ tribulatiónes justórum; et de ómnibus his liberábit eos Dóminus. Custódit Dóminus ómnia ossa eórum: unum ex his non conterétur. Mors peccatórum péssima; et qui odérunt justum delínquent. Rédimet Dóminus ánimas servórum suórum, et non delínquent omnes qui sperant in eo. Ant. [ ] Psalmus. Júdica, Dómine, nocéntes me; expúgna impugnántes me. Apprehénde arma et scutum, et exsúrge in adjutórium mihi. Effúnde frámeam, et conclúde advérsus eos qui persequúntur me; dic ánimæ meæ: Salus tua ego sum. Confundántur et revereántur quæréntes ánimam meam; avertántur retrórsum et confundántur cogitántes mihi mala. Fiant tamquam pulvis ante fáciem venti, et ángelus Dómini coárctans eos. 18 The just cried, and the Lord heard them: and delivered them out of all their troubles. 19 The Lord is nigh unto them that are of a contrite heart: and he will save the humble of spirit. 20 Many are the afflictions of the just; but out of them all will the Lord deliver them. 21 The Lord keepeth all their bones, not one of them shall be broken. 22 The death of the wicked is very evil: and they that hate the just shall be guilty. 23 The Lord will redeem the souls of his servants: and none of them that trust in him shall offend. Ant. [ ] Psalm.